What a difference a year makes: only one summer ago, the twins had to be coaxed to try the small slide in the playground and now they're going heads first down what Mr. V. assures me is "the BIG slide". I tried doing a little Face Time with them a few weeks ago and while their sister managed to stay for a short conversation, the boys would only shout "Hi, Grandma" as they hit the bottom before running back to the steps for another session. I've used the Simplicity sheet for my base; I love the neutral grey with the pop of red and bit of orange swirl. The front of the Elegant sheet is made of cut-aparts. I fussy cut the largest one and then cut it in half to form my bottom layers. The photo matting is from the Athena paper; I've adhered several layers of packaging to the bottoms to give my page some dimension. Also included in the kit is a package of 4 laser cut chipboard pieces from Creative Embellishments - Wavy Film Strip. I've taken one and applied a very thin layer of Prima Art Extravagance Texture Paste in Clear Crackle to give it a bit of teeth. When it was dry, I brushed it lightly with Prima Memory Hardware Artisan Powder in Parisian Rosewood; the result is a brick effect over grey. 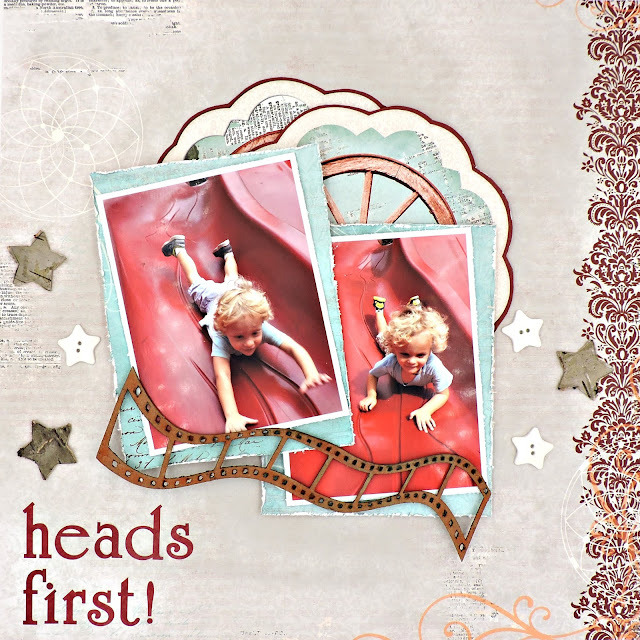 The alphas used in my title are from the Bella Rosa Combo sticker sheet. The stars are all from my stash: Prima Bark Icons and some vintage buttons that I found at Buddha & Beads in Eastham MA while on a visit with my brother and sister-in-law.